Eight years ago, I wanted to make a simple scarf for my mom that would be warm and cosy, so I chose a natural undyed Irish wool and used a Kool-Aid to custom-dye in a variety of lavender and plummy pink shades. I have written about this Kool-Aid dyed wool scarf before, but I wanted to write a new post because when I made the scarf in 2009, I wondered if the dye would fade or the Kool-Aid dyed yarn would pill. I thought that eight years would be a good test of the Kool-Aid dyed wool scarf longevity. Spoiler alert: It lasted! Originally, I dyed the yarn using this process. 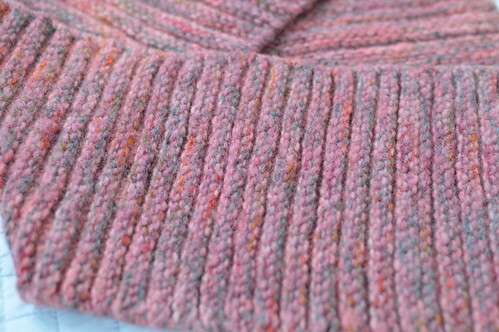 This is my original post about knitting this scarf using my hand-dyed yarn. I used 100% pure wool (so I had to be careful to not let it felt), which helped it take the dye best. My inclusion of vinegar made the dye fast and lasting, so do not skip that step. I read a pieces elsewhere at the time that vinegar is not necessary because the fruit flavour of Kool-Aid has enough acidity, but I was not taking any chances. Heck, I’ve had high-end sock yarns fade like the colors were created with washable markers and when you spend time knitting something you want it to last in every way. Of course, as an alternative to vinegar, you can use 5% Acetic Acid. And the glass/Pyrex bowl, that was important. But you can read the tutorial from back then to have all the details. Here are photos of the scarf now. It looks the same. No pilling, fading, moth holes, or unraveling. I am impressed because honestly, I was a very new knitter when I made this originally and it is reassuring to know my skills were decent enough to create a lasting scarf even back then. 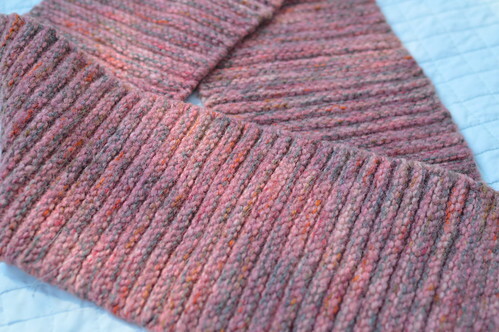 The Kool-Aid dyed wool scarf was knit using two yarns knit together as one (aka doubled up). I paired a hand-dyed wool yarn (Aran weight) with a self-striping sock yarn (Zitron Trekking XXL). The result had visual interest and depth and any striping or pooling was minimised by the thicker yarn. As you can tell from my posts since I first started knitting in 2008, doubling up yarn for knitting projects was a bit of a passion for me. 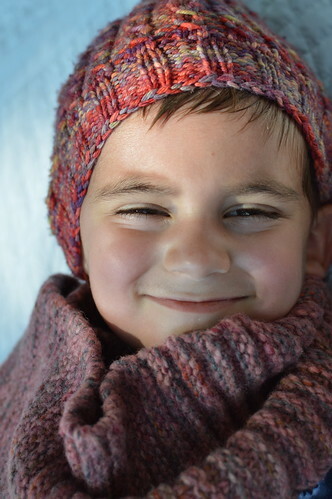 Originally, it was because it was a fun way to incorporate more color and knit something faster (on larger needles), but later I developed a love for the design features it could create. 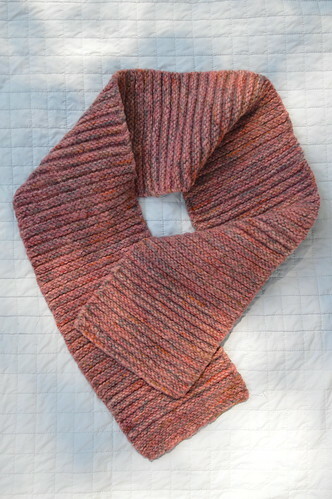 But, this scarf was the first project for which I wound the yarn cake to have the two yarns together. This simplified the process, but admittedly would not have been ideal for storage or if the wools were sticky or silky for tangle potential. In total, I used 375 yards of each yarn. One day, I’ll write the pattern up. Really, it’s more of a recipe because it is so basic. But sometimes basic is good. In this instance, it is. I gave it to my mom in December 2009. I remember that she had been very sick and rushed to the emergency room. Her winter coat was stolen from the hospital and it was winter. I chose a new one for her online (Lands End or LL Bean) in a plummy hue then decided to make her a bespoke scarf to go with it. A friend of hers was even visiting Ireland at the time so we met up for the scarf hand-off and she carried it back in her hand luggage and personally delivered it to my mom.She has enjoyed it ever since. I am amazed it remains in such good shape without her having blocked the Kool-Aid dyed wool scarf since I gave it to her. Here it is being modelled by me eight years ago. I look so much better rested before I had two kids! If you could dye yarn any color and know it would last, what color would you choose? This entry was posted in Knit Scarves & Cowls and tagged kool-aid.